Start your new Hong Kongcompany, ALL ONLINE! Check your company name and set up your company in a few hours. * Kindly notice that our website company name check is for reference only. The final decision is based on Companies Registry. Any existing company reserves the right to raise an objection due to a new company with a similar name. If you want more information in regards to the rules of Hong Kong company names, please check at our page. Register your new Hong Kong company in a minute! Are you planning to start your business in Hong Kong to internationalize your assets? Moving your business overseas is an important step and requires many crucial decisions. When you decide to form a business in Hong Kong you save on taxes and even many other expenses. Hong Kong offers business freedom, freedom from Government controls and Property Rights. Due to these reasons, Hong Kong is recognized as the ideal place to start a business. 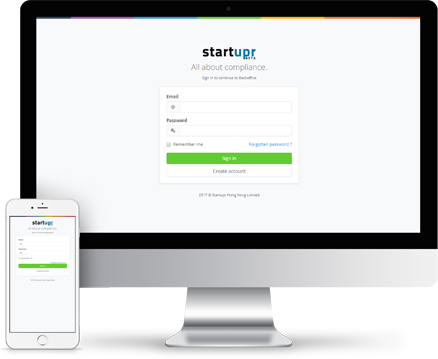 Startupr provides you with the Backoffice. It automatically checks for errors or problems as you complete applications. Why register with this system? An electronic copy of the Certificate of Incorpo- ration is generated. An electronic copy of the Business Certificate is provided. When you choose Startupr as your agent to complete the whole process, our prices are very reliable and reasonable. Contact us for more details regarding the Hong Kong Company Formation Fees. If you are looking to expand your assets outside of your country, investing in Hong Kong is a great way. HK is considered as the most trustworthy, reliable and safest global city for starting a new business. Also, it is much easier to transfer money into different currencies because banks in Hong Kong are used to handling various currencies efficiently. Establishing a company in Hong Kong is much easier than you may think. You can be from any nationality in the world to be the company shareholder and director, and don’t need to be a Hong Kong citizen. By setting up a company in Hong Kong, you can save a lot on set-up costs. We can assist you in scheduling your bank interview and documentation preparation. You do not need a physical address to form a company in Hong Kong. Instead, you can look for various services that can help you in setting up a registered address. When you choose us, you can use our registered address and save. With the use of Startupr’s registered address, we can notify you once we receive any letters from the government for your company. If your transactions are outside Hong Kong, you can apply for tax exemption status from the IRD and once the accounting is audited, Startupr will submit the tax exemption query letter to IRD. Our success rate for tax exemption status is as high as 95%. By forming a company in HK your taxes will be as low as 16.5% or 0% if you’re exempted from the taxes by IRD for offshore activities. Hong Kong has the best banking services with no exchange control. This means little restrictions for transfer limits from the banks here in Hong Kong. Your company’s fund can freely be transferred and which provides a safeguard for international trade. At Startupr, we can help you in fixing a meeting with your chosen bank manager. Hong Kong is located in the heart of Asia, and acts as the gateway to Mainland China for international business, while enjoying a separate taxation and legal system. Also, it is a financial hub and key regional trade center, ranking high for foreign investments and as the headquarter for international business in Asia. Annual return. It includes the list of directors & officers. It must be filed within 42 days of the anniversary of the first registration date, along with a fee of $25. The initial annual audit must be submitted within 18 months after incorporation date. the renewal must be one month before expiration. will need to file annual audit reports and tax filings to the IRD. Ideally, the e-Certificates for companies limited by shares are issued within 1 hour after the delivery of expected papers at the e-Registry. But when the application is delivered in the form of Hard Copy, normally it takes three to five working days to complete the entire process. Are you in a hurry to set up your company in Hong Kong? With Startupr, you can get it done in the same day! If we receive your payment and order before 10 A.M. HK time, we prepare within the same day by 5 pm HKT, submitting directly to the Hong Kong Government Companies Registry Office through our unusual and amazing Same Day system. Under normal conditions, we send you an official e-mailed e-documents, which includes your Business Registration and Incorporation Certificates, along with your new Company Number in less than 2 hours. And from that point on, you’re in the business! So if there are many companies providing you the same facilities as we do, why should you prefer to choose Startupr? Our unique same day check system ensures that all the information is checked on the same day as it is entered in the form. After that, our system sends your data automatically to the Hong Kong Registry Forms and is submitted to the government portal. Due to the efficiency of the system, our rates are comparatively lower. We communicate directly and clearly with our International clients in a reliable way. Our services are not only limited to our offices; they go beyond our offices. The prompt and orderly arrangements leave you more time for your own business,. All your feedbacks and suggestions are welcomed at [email protected], and we try our best to put them into practice. Yes, Startupr has been recently recognized by the Hong Kong Business Magazine as one of the “10 Most Interesting Start-Ups In Hong Kong”.